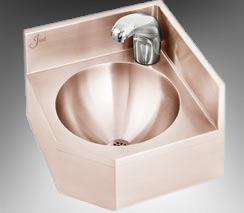 Fixtures, Sinks & Hand Wash Stations Produced with... CuVerro® Antimicrobial Copper Surfaces to MAXIMIZE Healing Environments! Antimicrobial copper surfaces kill pathogens* within 2 hours of exposure and continue to kill bacteria 24/7 to maintain healthy environments! Antimicrobial Copper touch surfaces kill the microbes that cause infections where they lie. CuVerro® Antimicrobial Copper-Nickel Alloy Surfaces kill more than 99.9% of bacteria* within 2 hours, and deliver continuous and ongoing antibacterial action. EPA registered copper alloys are the only solid surface materials that can make this claim! Solid defense against harmful microbes. No other solid surface is proven to be more effective in continuously killing bacteria that cause infections. CuVerro® antimicrobial copper has an inherent ability to kill bacteria, unlike other solid surface materials like formica, wood, or plastic. Copper is the only active, bacteria-killing ingredient in CuVerro alloys. CuVerro's EPA-registered surfaces, begin killing pathogens* on contact, killing 99.9% within two hours, and keep on killing 24/7. 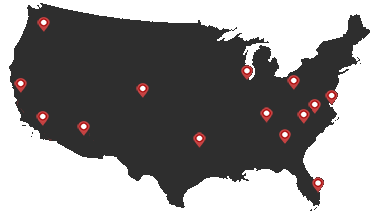 Just has been a leading manufacturer of hospital fixtures. We now provide health care products that help kill bacteria* which cause infection, while advancing cleanliness and compliance. Our product made with antimicrobial copper surfaces enhance current infection control practices while helping to ensure maximum effectiveness. Our products contain antimicrobial copper, the world's most effective antimicrobial solid touch surface material that kills 99.9% of bacteria*. CuVerro antimicrobial alloys are made from up to 100% recycled copper material and are 100% recyclable. In fact, nearly all of the copper mined to date is still in circulation because the recycling rate of copper is higher than that of any other engineering metal. The bactericidal properties of copper are inherent, so no additives are required. For healthcare environments, especially, copper provides the assurance of no VOCs (volatile organic compounds), PVC (poly vinyl chlorides), phthalates or other pollutants that can adversely impact air quality. In keeping with the environmentally friendly properties of copper, no sealants, glue, or adhesives are used in the manufacturing processes of CuVerro antimicrobial alloys. 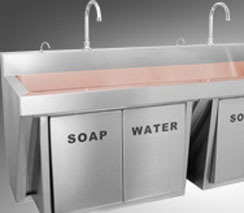 Add this sustainability to CuVerro antimicrobial properties and flexibility and you have advantages that are truly unmatched for sinks, fixtures and hand wash stations produced with CuVerro Antimicrobial Copper Surfaces. More public and health care environments supplement current infection and disease control practices with antimicrobial copper, antibacterial products, hospital sinks, hand wash sinks and scrub sinks! Copper has played a role in Green Building, and has been one of the materials of choice for energy efficiency and sustainability, and a mainstay in solar, wind and wave renewable energy systems. The EPA has evaluated the acute toxicity of copper and found there to be “no risk to public health.” Since early human existence, copper has been an essential material in many applications. One of the most frustrating problems facing hospital infection control is how to prevent health care-acquired infections. 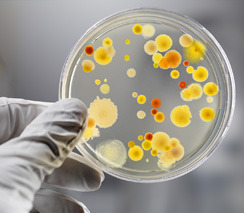 Exposure to organisms often found in hospital environments, such as intensive care unit (ICU) rooms, can result in additional illness and sometimes death for people who come into contact with these "bugs" as many infectious diseases are transferred by touch. Kills greater than 99.9% of bacteria* within 2 hours, and continues to kill 99% of bacteria* even after repeated contamination. Delivers continuous and ongoing antibacterial* action, remaining effective in killing greater than 99.9% of bacteria* within 2 hours. Helps inhibit buildup and growth of bacteria* within 2 hours of exposure between routine cleaning and sanitizing steps. Kills greater than 99.9% of Gram-negative and Gram-positive bacteria* within 2 hours of exposure. *Laboratory testing shows that, when cleaned regularly, CuVerro surfaces kill greater than 99.9% of the following bacteria within 2 hours of exposure: Methicillin-Resistant Staphylococcus aureus (MRSA), Staphylococcus aureus, Entrerobacter aerogenes, Pseudomonas aeruginosa, E. coli O157:H7, and Vancomycin-resistant Enterococcus faecalis (VRE). The use of CuVerro® bactericidal copper products is a supplement to and not a substitute for standard infection control practices; users must continue to follow all current infection control practices, including those practices related to cleaning and disinfection of environmental surfaces. This surface has been shown to reduce microbial contamination, but it does not necessarily prevent cross contamination. These surfaces have been shown to kill microbial contamination. It kills more than 99.9% of bacteria within two hours, and continuously delivers antibacterial** action between cleanings. EPA registered copper alloys are the only solid surface materials that can make this claim. CuVerro’s continuous antibacterial action never wears or washes away. Antimicrobial Copper is the only solid surface material registered by the U.S. EPA to continuously kill bacteria* that pose a threat to human health. No other solid touch surface, including silver-containing coatings, has this kind of registration.